"Both are gorgeous impressions of soul, jazz and blues, brought together through the legacy of standards and new compositions. 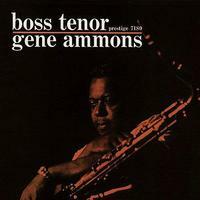 The tonality of Gene Ammons in particular is transfixing and it is with the stereo reissues from Prestige that Gene will get a lot of love with multiple titles scheduled for release. Booker Ervin was another great tenor sax player and his contributions to the Prestige vaults are timeless with Exultation!." — Erik Otis, Sound Colour Vibration, May 9, 2015. For nearly a quarter-century, beginning in 1950, tenor saxophonist Gene Ammons (1925-1974) was among the brightest stars in the Prestige Records firmament. Whether leading, or partaking in, one of Prestige’s jam sessions, immersing himself in the organ-dominated blues and gospel grooves that in the 1950s came to be called “soul jazz,” or digging deep for heart-rending ballads, Ammons was multiply masterful. And in 1960, leading a quintet featuring the impeccable pianist Tommy Flanagan, plus Ray Barretto’s piquant congas, he produced the insuperable Boss Tenor. From the blues that drips from “Hittin’ the Jug” and “Blue Ammons” to the infectious medium bounce of the standards “Close Your Eyes” and “Canadian Sunset,” and from the sophisticated swing of “Stompin’ at the Savoy” to the finger-poppin’ bop of “Confirmation” and the after-hours balladry of “My Romance,” Boss Tenor has something for everyone claiming to be a fan of modern jazz. How can it get this good? I just can't imagine a recording better than this. This is why you build your system...hoping to experience something like this album. Jaw dropping. Do not miss out on this album. Chad and crew have done it again. I'm really looking forward to the remaining releases. On par with Music Matters 33's.